There are two types of electric circuitA collection of wires and electric components connected together in such a way that electric current can flow through them. - series and parallel. We've already come across series circuits. In this type of circuit, the components are arranged end to end and so the electric current flows through the first component, then through the next component and so on, until it reaches the battery again. Here's a series circuit to remind you. Use Circuit Builder to see what happens if you add more bulbs to a series circuit. If there's a gap in a series circuit or maybe one of the components has broken, the current can't flow and so, the whole circuit turns off. In parallel circuits, the components don't have to be end to end because the circuit can have branches. In a parallel circuit, the current splits as it reaches a branch so the current flows around both branches. If there's a gap or broken component in one of the branches of a parallel circuit, the component(s) in other branches will carry on working. 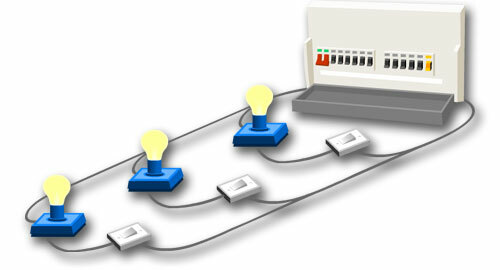 If we put a switch in each of the branches of a parallel circuit, we can control each component separately. This is how our homes are wired; each room has it's own parallel lighting circuit so, if a light bulb blows, the other light bulbs stay lit. 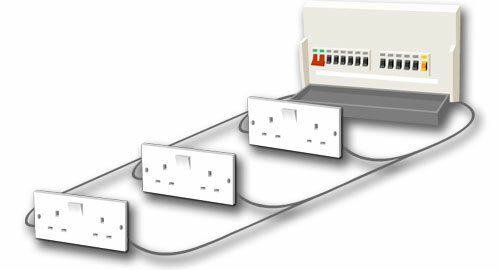 The 13 Amp mains sockets in our homes are also wired in parallel. We call these parallel circuits ring mains. The national grid is also a parallel circuit - but on a massive scale!